Billy Childish may have stolen the (art) show at Greenbelt with his engaging conversation with Malcolm Doney - which began with him presenting himself as a determined religious outsider ('I never read the Old Testament ... it's all a bit bloody and ghastly, innit? No, I like the other feller, the later one, he's all friendly...') and developed into a candid and thoughtful explication of his Chatham-style, damaged goods take on spirituality. But in the venue of racing legends where around the site equine champions are celebrated in outdoor statuary, romanesque wall friezes and Hall of Fame history display panels, it was a red horse which most captivated me, and many others, the work of another artist in the very excellent Visionaries exhibition. 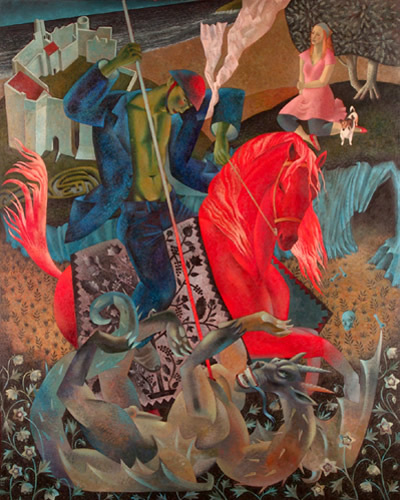 ‘Once I'd completed the horse, the incandescent colour of which was an early notion I'd had to make the saint's mount almost a creature of another, more heavenly realm, I knew in a moment that no conventional skin colour for Saint George could withstand close proximity to that flaming Cadmium Red. Suddenly green became my favoured option for George. And once I'd started painting with a green-laden brush, I loved the results. I loved the way red applied to George's lips and hectic cheeks transformed his appearance into a glorious and unexpected adventure. I loved the links green made to ideas of re-generation and rebirth, the allusion to a whippy sapling flooded with the promise of newness, growth and hope. Just what a warrior saint should be. And of course there was the idea of Viriditas (Green Flame), the term coined by Hildegard of Bingen to express the 'greening power of God'. All this, of course, at Greenbelt which really pulled out the stops on the visual arts front this year. Loved it.